Anyone in the market for a KOREAN J28 12-string? I need $500 for it. Comes with the GC72 HS case. Hope y'all are doing well! Yes, we're still making music, but we've got FOUR 12-strings right now and we need to thin the herd. They won't make them like this again, you know! Holla if ya want her! The Festival 12 will be sold as is, though. I'm just not playing Leo Kottke slide like I used to, so OUT it goes! Makes a nice ANNIVERSARY gift! Good luck Squint. I just added to the herd, not a washie sorry, so I'm on hold for a while. No worries. We'll see what happens. Times is tough all over, but that's when you get the best deal! And the tune on our MySpace page is listed as Marlowe feat. Matt Aschkynazo... a great local jazz guitar hero pal of ours using his customized Strat! HEY! FREE SHIPPING WITH BUY IT NOW!!! Nice song Squint, and the 12er does sound great! Could someone tell me the model of the guitar on the sofa on the right hand side of the white JazZ GUITAR. 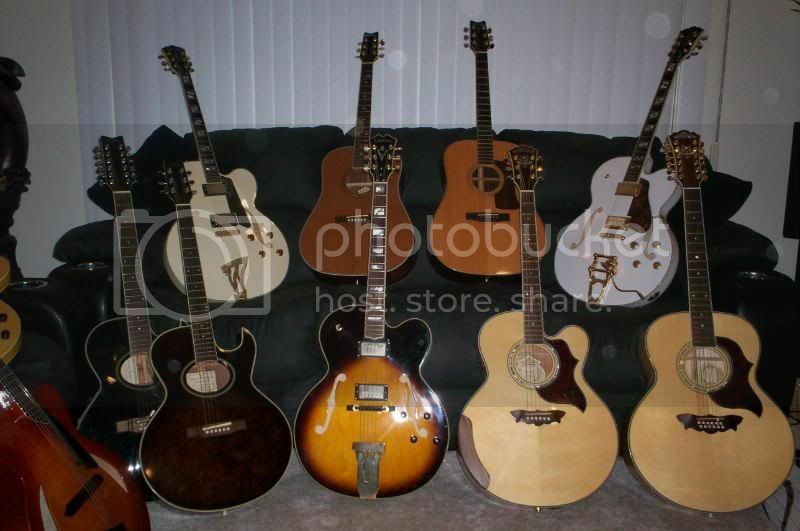 iT IS THE ONE WITH THE DARK SPRUCE TOP. I have owned one of those (at least something that looks close to it since late 80s or early 90s. i cannot find any reference to it from the WAshburn sites. It has a fancyW where the strap nut would normally be on teh back of the base of the neck. It had made in Korea little sticker which has since dissapeared. I has binding and on the back in the middle of the body, there is a white binding that goes from the top of the body to the bottom. Would be very greatful for any assistance in identifying. I have owned the guitar since new..so it has not been mucked around with.